(CBS/KIRO/AP) VANCOUVER, British Columbia - Angry, drunken fans ran wild Wednesday night after the Vancouver Canuks' 4-0 loss to Boston in Game 7 of the Stanley Cup finals, setting cars and garbage cans on fire, smashing windows, showering giant TV screens with beer bottles and dancing atop overturned vehicles. Police started using flash-bangs - grenades, which are made to distract and disorient, rather than injure - to break up the mobs. While some members of the crowd expressed dismay that the police didn't take a more aggressive apparoach to the early vandalism, others said officers were heavy-handed. "There's people who've been coming through the crowds suffering from tear gas," said 26-year-old Amy Zevick. "I'm seriously disappointed in the city of Vancouver and the country of Canada because it makes me feel the insecurity I read about in other parts of the world. I don't thinks it's OK to loot, but I also don't think its OK to over-police and assume that every person is guilty." 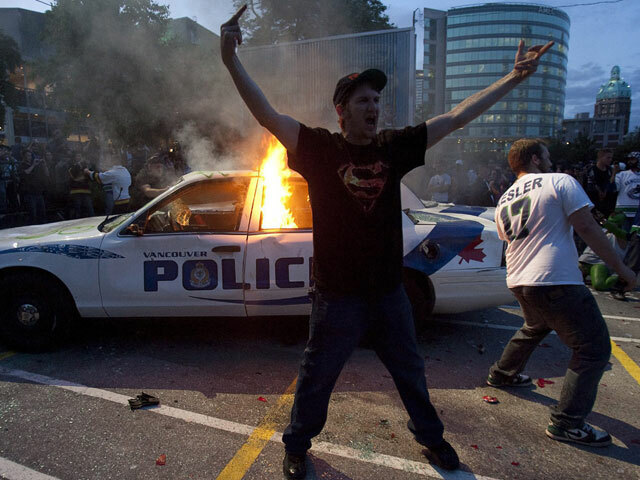 The chaos was reminiscent of a similar scene that erupted in the city in 1994 following the Canucks' Game 7 loss to the New York Rangers, reports the station.